Located in a towering late Gothic revival building -- apocryphally described by locals as the first million-dollar high school west of the Mississippi River -- Topeka High School, situated just four blocks from the Statehouse, is the pride of Kansas' capital city. The hallowed halls of the 84-year-old building have served as the academic home of Herbert Hoover-era Vice President Charles Curtis, basketball legend Dean Smith, the revered Republican Sen. Nancy Landon Kassebaum, and renowned poet and novelist Ben Lerner. The school's bevy of Advanced Placement courses and its acclaimed programs in music, theater and debate attract many transfer students who live outside the school district; I was one of them. Topeka High's tale, however, is ultimately one of two schools. Its racial and socioeconomic diversity is one of the school's most trumpeted selling points, but the lived experiences of the school's poor and minority students are vastly different from those of the predominantly white and affluent students who flock to the school for its robust academics. Nearly 30 percent of Topeka High's freshmen drop out before graduation, compared with a statewide average of 15 percent. More than two-thirds of students receive free or reduced-price lunches. According to figures provided by the school, about 40 percent of graduates do not go on to any postsecondary education or training. Those are the students slated to be hit hardest by Republican Gov. Sam Brownback's public education cuts, which he has imposed to help fill the massive revenue shortfalls created by his income tax cuts for the wealthy. Under a block-grant funding scheme Brownback signed into law this winter, Topeka High's school district is slated to lose $3.6 million in funding this year and over the next two years after that, jeopardizing a wide array of academic and extracurricular offerings; for Topeka High students, athletics programs, arts education, and foreign language courses could be on the chopping block. Other districts have cut short their school years; others still warn they may not have enough toilet paper to last out the school year. I graduated from Topeka High in 2009 -- one year ahead of my longtime friend Chloe Hough, the waitress who sparked a viral Internet sensation over the weekend after a chance encounter with Brownback. Working her last-ever shift at Boss Hawg's, a popular Topeka barbecue joint, the 22-year-old posted on Facebook Saturday night: "You guys 911 emergency: It's my last shift and I am waiting on our governor. What should I say to him. This is not a test. Go." Her ultimate decision? 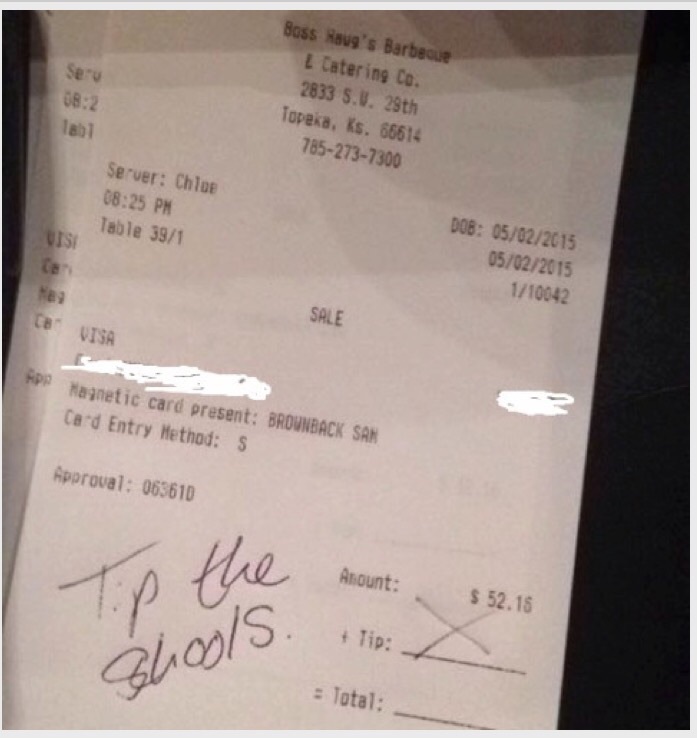 On the line where customers typically include a tip, Hough marked a big "X," writing alongside it, "Tip the schools." Brownback's office has yet to comment; the closest we've come to an official statement was a petty attack from the director of the Kansas Republican Party, who denounced Hough's "arrogant stupidity" on Monday. Hough, who said her younger sister with special needs has lost educators because of budget cuts, discussed the brouhaha with me over the phone on Monday. Our conversation, which has been lightly edited for clarity and length, is below. You’ve received media inquiries from the New York Times, the Daily Mail, and now you’re being pestered by an old friend who works at Salon. Did you expect this kind of reaction? No, I had no idea at all. So there you were, working your last shift at a barbecue joint, and in walked the governor. Did you know instantly that you wanted to say something? As soon as I saw him, I was like, “This is kind of a sign. It’s my last shift. I have to do this." How did your supervisor respond? I’ve been trying to keep that separate from everything else. Oh no, I have no idea. I walked away [before I could see his response] and had other stuff to do. And let’s be honest: I didn’t really care how he responded. You could’ve written a message about a number of things: his tax cuts, his rollback of LGBT and women’s rights. Why education? My sister is a factor. She’s lost a lot of educators, and just hasn’t had a good education experience in general. So that bothered me. She’s lost a lot of teachers and paraprofessionals, but more generally, there’s been such a lack of communication between the state government and the schools. I met with a state legislator recently, and with the block grants, the attitude was basically, “We’re going to get this passed no matter what they want.” I think that’s ridiculous. That’s what I was more mad about. I know a lot of people think what I did is funny, and it’s gone viral. But I honestly hope, even though this will blow over eventually, that people continue to question the way things are going. Would you say you’ve always been a political person, or has Brownback been the catalyst? I think [I’ve been a political person]. But he’s definitely awakened something more, because all of his policies are just backwards. He wants to take Kansas back into the Dark Ages. And it’s not education. It’s the fact that people can get fired for being LGBT. It’s the fact that we don’t have equal opportunities. It’s all kinds of things. And tweeted “he blows a lot”? “He blows a lot,” yeah. Only to have his office retaliate by tipping off her school. So when you did this, did you think that there was any chance you’d provoke a similar reaction? I hope they would — I welcome it. And you can write that! I’m sure that Sam Brownback is a devoted Salon reader. In the 100 percent chance that he’s reading this, is there anything more you’d like to say to him? I just don’t think it’s fair that you can essentially buy your way into politics. He has the Koch brothers funding him, and it’s not like he has any good ideas. And I don’t understand why he got reelected. But I also want him to know that I’m not afraid of him. Because a lot of people have said to me, “You’ve done something I could never do, I work for the state or I’m a teacher and I would get fired if I said something like this.” And that’s not right. You can talk about your opinions, and you shouldn’t have to worry about being fired.